As you would expect, the Alpha 450 bears more than a passing resemblance to the Alpha 550. The differences between them largely come down to the extra buttons and controls on the latter for using Quick AF Live View and the tilting screen. So similar are the two cameras that it appears the smaller non-tilting screen of the Alpha 450 has simply had a plastic surround added so that it slots perfectly into the space required for the larger tilting screen of the Alpha 550. The body of the Alpha 450 is plastic with a metal lens mount, but it is well put together. Even so, it has what can only be described as a ‘plasticky’ feel to it, perhaps due to the smooth rather than textured body, and because it is slightly larger (though lighter) than some of its competitors. One part of the body that is textured is the large grip. With a rubber coating and contoured design, it is extremely comfortable to hold and the shape of the grip guides the forefinger naturally to rest on the shutter-release button. 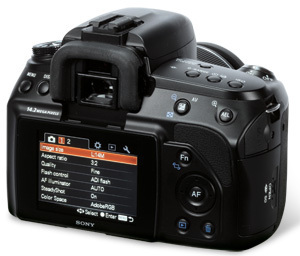 Like other entry-level and enthusiast Alpha cameras, there is no rear control dial, only a single front control. This is generally not a problem – most other cameras at this level have only a single front control. However, there are a few buttons on the camera that could be better positioned. For example, annoyingly, the ISO button is on the camera’s top plate in no-man’s-land, where it’s too far from the shutter button to be easily pressed with your forefinger and too far from the rear of the camera to get at it easily with your thumb. The result is that it is awkward to change the ISO sensitivity single-handed. The menu button is positioned at the top left of the rear of the camera, which makes it easy to reach with your left thumb when holding the camera. However, it would have been better placed in the position occupied by the AF button – that is, in the centre of the cursor control dial. Similarly, the playback and delete buttons would be better positioned at the top left of the rear of the camera, replacing the menu and display options. It is likely that you would be using both hands to review your captured images, and locating the buttons here would make it easier to search through and delete images. Most of the key shooting settings can be found by pressing the Fn button on the rear of the camera. The only option I found that couldn’t be changed in this shooting menu was the image quality, which is changed in the main menu. This was a mild annoyance when I wanted to change from shooting raw + JPEG files to JPEGs alone, which would allow the HDR mode to be used. There is nothing particularly restrictive about the build or handling of the Alpha 450 – it is just that a tweak here and there would have speeded up and improved its overall handling.